The permanent version of the calendar event, which is normally run in winter, so here is a chance to ride it again perhaps in better weather. In fact, if you pick a good day to ride (and it's a Perm, why would you pick a bad day?) you could buy a sandwich at Ellesmere petrol station and find a bench beside The Mere for a perfect alfresco lunch. 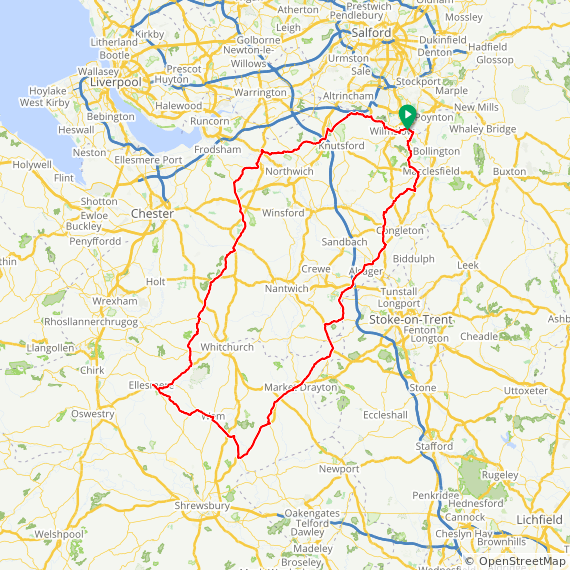 The route passes the many Meres of Cheshire and Shropshire (Mere, Budworth Mere, Hatchmere, Delamere, Oakmere, Newton Mere, Blake Mere, Ellesmere, White Mere, and Colemere). This is excellent cycling countryside with lots of quiet lanes. Although not a hilly ride, these are numerous undulations, but probably fine for those who insist on riding fixed. The 2019 revision has done away with several controls that were open for limited hours, and all controls now have 24/7 options.